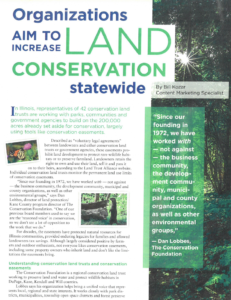 The January issue of Illinois Realtor highlights the benefits of conservation easements and the organizations working to preserve more land. Dan Lobbes, director of land protection for The Conservation Foundation, and Mary Vandevord, Heartlands Conservancy president and CEO, share their views on land preservation in the article, which also mentions Prairie State Conservation Coalition. ‹ Land Trust Census is out!